Forget home, there’s no place like Oz. Salma Hayek and ABC are developing an eight-part miniseries adaptation based on the Oz-centric book “Wicked,” according to The Hollywood Reporter. Gregory Maguire’s best seller retells the “Wizard of Oz” story from the sympathetic viewpoint of the Wicked Witch of the West, the green Elphaba. It has already been translated into the hugely successful Broadway musical, but Hayek’s version will not be set to song. Hayek and her producing partner Jose Tamez guide the version under their Ventanarosa Prod. with ABC Studios. Erik Jenderson, who won an Emmy for his work on HBO’s “Band of Brothers,” is writing the script. There’s no official word yet on whether Hayek herself will appear in the production. NBC Universal is also developing a version of “Wicked” that is based on the musical (so, apparently, there will be at least two places like home). On January 2nd, a cow gave birth to a calf with two heads in the eastern European country Georgia. Apparently, the calf's mother has refused to let it nurse, which is not an uncommon response when an animal senses its offspring has something seriously wrong with it. Despite that, the calf has been feeding from a bottle with both of its heads. Unfortunately, chances of its survival to adulthood are not good, but possible with lots of human care. See examples of other multiple-headed animals on Animal Planet's Weird, True and Freaky video page. VIDEO: Watch video of the little two-headed cow. The world’s largest online search engine, Google, has updated its popular Google Goggles mobile search application, making it a whole lot smarter. Google Goggles works by utilizing the camera in your smartphone to retrieve useful information in search results, essentially, you could snap pictures of objects, text, photos, people, landmarks, among other things, and the app then retrieves search results after scanning the photo. In late August 2010, Google said it would release future updates that would make the app more effective with more relevant search results. Since that announcement, today marks the biggest update the app has received. The latest Google Goggles version 1.3, available now in the Google Android Marketplace and the Apple iOS App Store, largely brings under-the-hood enhancements to take advantaged of improved algorithms that significantly increase the accuracy of the app when scanning things like a product barcode. The company also improved the apps ability to better recognize content and other elements in magazines, including text, titles, people, and major corporate brands on magazine covers. Google says the improved search results related to magazines work best for magazines published after August 2010. One of the most impressive additions to the app is its ability to solve Sudoku game puzzles, by simply snapping a picture of the puzzle board; the app is able to analyze and easily and intelligently solve the missing numbers. Although Google Goggles has been available in beta form for Android devices for about a year, the app only made its way onto Apple products late in the summer of 2010 after Google had difficulties in getting the app approved into Apple’s App Store. In our testing, the application worked very quickly, but not very consistently in analyzing busier pictures. 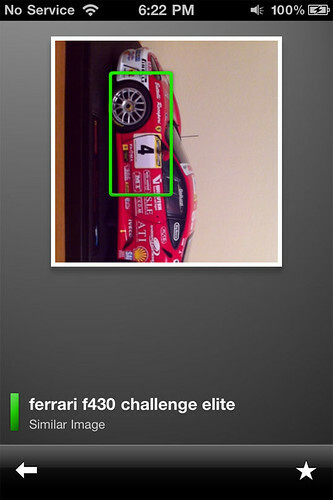 For example, when a picture was snapped of a Ferrari model car, the app easily recognized the fact that it was indeed a model car, and even the type, but it also had difficulty recognizing popular brands on the car itself, but it was still fairly successful when closer range photos were snapped. Bar codes of popular products like Kellogg Corn Flakes worked seamlessly. Belgium girl dancin around Antwerp! Remember how the ban on Four Loko effectively outlawed the booze-filled caffeinated energy drink? Now, some wholesalers are unloading unsold warehouses of the stuff to a company in Virginia. The company will turn it into ethanol and add it to gasoline. Some choice words from the geniuses behind this after the jump! According to the Associated Press, wholesalers across the East Coast have started trucking their cases of Four Loko to MXI Environmental Services, one of just three facilities in the United States that recycles ethanol. Brian Potter, the company's president, is obviously excited. "We're equipped to process four truckloads a day, and we're at full capacity," he said. "There are about 30 different products involved, and we've only seen a couple of them at this point. It could go on for several months." The article points out that just one truckload of Four Loko amounts to 2,000 cases of the drink. Figure each case carries six cans, and that's about 48,000 Four Lokos recycled daily. Isn't that so much better than the booze getting recycled in the digestive and urinary tracts of co-eds? China's vaulting economic ambition has set a new record with the construction of the world's longest bridge over water. Built in just four years at a cost of £5.5 billion, the sheer scale of the bridge reveals the advances made by Chinese engineers in recent years. No longer dependant on western expertise for such sophisticated projects, the six-lane road bridge is supported by more than 5,200 columns and was designed by the Shandong Gausu Group. When it opens to traffic later this year, the bridge is expected to carry over 30,000 cars a day and will cut the commute between the city of Qingdao and the sprawling suburb of Huangdao by between 20 and 30 minutes. At least 10,000 workers toiled in two teams around the clock to build the bridge, which was constructed from opposite ends and connected in the middle in the last few days. A staggering 450,000 tons of steel was used in its construction – enough for almost 65 Eiffel Towers – and 2.3 million cubic metres of concrete, equivalent to filling 3,800 Olympic-sized swimming pools. Chinese officials said that the bridge will be strong enough to withstand a magnitude 8 earthquake, typhoons or the impact of a 300,000 tonne vessel. With its economy growing by 16 per cent a year, Qingdao is one of China's fastest-growing and most prosperous cities. The main port of the Chinese navy and home of Tsingtao Beer, China's best-known brew, it hosted the sailing events of the 2008 Beijing Olympics. Briefly occupied by Germany between 1898 and 1914, Qingdao's mix of early 20th century European-style villas and churches, sandy beaches and reputation for fine seafood has seen it become one of China's most popular domestic tourist destinations in recent years. It is also regarded as a highly desirable place to live. A 2009 Chinese survey named Qingdao as China's most liveable city. Qingdao's residents have hailed the bridge as a long overdue marvel. "I'm so happy the bridge is finished. The old road between Qingdao and Huangdao is so crowded and now my journey will be much easier. We are a tourist city with beautiful beaches, so it is important we have good transport links," said one commuter on sina.com, China's biggest internet portal. But people from other parts of China have denounced the huge cost of the bridge, especially as it only cuts the distance between Qingdao and Huangdao by 19 miles. "To spend billions to save 20 minutes driving time is a waste of taxpayers money. It's just a show project to make the governor of Shandong look good," complained one commentator from Jilin Province in China's northeast. And with Beijing pumping billions into boosting China's infrastructure, the Qingdao Haiwan Bridge will not be the world's longest sea bridge for very long. In December 2009, work started on a 31 mile bridge that will link Zhuhai in southern Guangdong Province, China's manufacturing heartland, with the financial centre of Hong Kong. The £6.5 billion project is expected to be completed in 2016. If you love arcade games, but don’t have the means, the space, or the desire to pack a whackload of them into your residence like Ricky Schroder in ‘Silver Spoons’… what I’m about to show you could be right up your alley. Making its debut at the 2011 Consumer Electronics Show this past week was the iCADE miniature arcade game controller for iPad. Check it out. The old-school joystick, large buttons and arcade cabinet make this a must-have iPad accessory for the retro-gamer. The cabinet opens from the top, allowing you to slide your iPad into it in portrait or landscape. All controls connect via Bluetooth, and yes, while this is surely a novelty, it’s one I could see tucked-away in my office for use from time to time. The folks at ION Audio have outdone themselves on this one, as it fits the iPad beautifully, and works pretty darn well to boot. To check it out in action, hit play on the video above. Look for the iCADE to become available at some point this spring for $99. To the average consumer, the intricacies of the wireless technologies used by cellphones and other mobile devices are confusing. Fortunately, cell phone carriers have made it easier on us by inventing the “G,” a nebulous standard that makes people think they understand what they’re getting when they sign up for that two-year contract. The bad news: The carriers themselves typically don’t care about what a 3G or 4G network should actually be. And now, as proof of concept, AT&T has re-branded their existing 3G network as a 4G network. At least now we’re clear on exactly what ‘4G’ means: Essentially, nothing. By definition, 4G network “standards” like LTE (Long Term Evolution) run at speeds of 1 Gbit/s for low-mobility connections like cellphones. But it doesn’t mean they have to. That doesn’t matter much to carriers, however, since most consumers don’t know enough about how cellular tech works to wonder or even care about the actual capabilities of the network they’re shelling out for. After all, chances are that even if they could, those under-trained representatives aren’t going explain to you the difference between HSPA Plus (what AT&T uses currently) and LTE. Like always, they still only want to do two things: Sell you a phone, and sell you a contract with a network that operates on muddied and arbitrary wireless standards. John Donovan, AT&T’s chief technology officer, said speeds on HSPA-plus and LTE phones will feel similar now, but users will start to notice a difference in the two technologies once richer applications become available. I had to re-read that first part at least 3 times because it is so absurd that I could not wrap my brain around it. Essentially this is AT&T saying, “we don’t need to wait for a faster network, because we’ve been sufficiently awesome this whole time — we just forgot to give to tack on that cool name that everyone’s using.” And as for applications not being “rich” enough, that too sounds like a massive cop-out. I’m pretty sure I’m not the only one that’s seeing the apps on their smartphone choke on current data speeds. AT&T’s not the only one making semantic upgrades, however — T-Mobile, which still runs on the same ‘3G’ HSPA Plus networks as AT&T, has also recently switched to the “4G” nomenclature. Don’t get me wrong, it’s certainly possible to get faster speeds on a 4G handset using the same old networks, but it’s hard to imagine the boost being anything but marginal. So in the end, it’ll be up to us to find out just what the heck our carrier’s ‘4G’ network actually is. Lifehacker’s got a pretty decent guide. Read up and don’t be a sucker.